The Wind Energy Science Conference (WESC) is a biennial event organised by the European Academy of Wind Energy and offers an open forum for discussion which spans the traditional scientific borders. Wind Energy scientists and engineers are given the opportunity to present their latest findings and discuss the challenges which they have faced with a multi-disciplinary community. The conference will take place on June 17-20, 2019 in Cork, Ireland. We are proud to host a mini-symposium at WESC 2019, which will be dedicated to an H2020 Project – our very own EU-SysFlex. 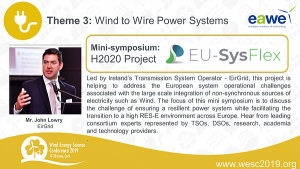 The mini-symposium will be led by John Lowry from EirGrid, Ireland’s Transmission System Operator, and you will hear from our project’s speakers as well as other leading experts and researchers.